India welcomes you with its riddles, ancient wisdom, exquisite aromas and lost treasures in this match 3 adventure. Collect more than 70 artifacts on your travels and use incredible power-ups to set the highest score. You will visit Taj Mahal, enjoy the perfect beaches of Goa and explore ancient cities. Complete challenging puzzles while travelling along the mighty Ganga River and find the forgotten temples of the past in the jungle forests. As you continue your journey prepare for excitement as each new level brings new challenges! 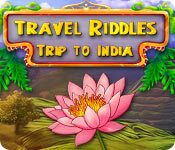 Travel Riddles: Trip to India is rated 3.4 out of 5 by 24. Rated 5 out of 5 by rottiestrut from thumbs up. i give it a thumbs up..enjoyed it very much. Rated 5 out of 5 by nufsober from WHAT A WAY TO HAVE FUN AND RELAX!! I AM GETTING TIRED OF PLAYING THE SAME TYPES OF GAMES, OVER AND OVER. THIS ONE IS A REFRESHING CHANGE. JUST LET YOUR FINGERS DO WHAT THEY KNOW TO DO, AND YOU'LL END UP HAVING A BLAST!! Rated 5 out of 5 by yelwbkrd35 from M3 Winner! This M3 is a whole lotta fun. There isn't any story to tell of but then again I don't play these for a story anyway. Love the cute power ups especially the sound of the rockets. It's very cute and fun all around. Did anyone notice the sound track sounds like a 80's band? Their name rhythms with something like "TalkingHeads"? Well that made it even more fun . A buy for M3 collectors. Rated 5 out of 5 by MEnr56 from VERY GENEROUS WITH COINS & POWER-UPS Most often power-ups are not only expensive but also are few and far between in Match3 games with the ability of earning coins very time-consuming. While the 2nd & 3rd power-ups are indeed expensive -- I only purchased the +5 ones -- the coins add up quickly allowing you to purchase ALOT of these power-ups. I had purchased the TIMER power-up but RARELY used it when I quickly realized that extra time and my bombs were NOT going to accomplish my goal. I would not purchase as many of the TIMER power-up in the future -- if I were to replay this game. 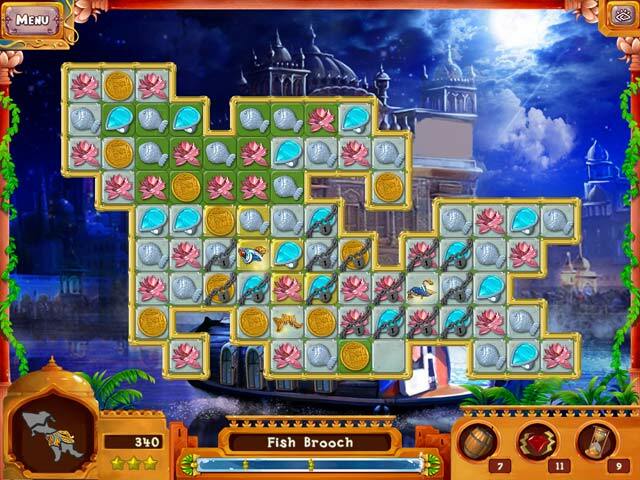 This was on the 1st of many future levels that had the firecrackers which you have to do your best to aim accurately to turn tiles that are not connected to the main frame of the board green AND these firecrackers are LIMITED per level. WARNING On this aforementioned level, however, I DID run out of the firecrackers B4 realizing that I had an artifact piece to gather in the upper left-hand corner and separate from the main board. I don't know if it was set-up this way BUT when I moved said piece upward, it did come out of the square thereby completing the level for me. The crystal power-up is really nice because when placed on a chained tile, it releases ALL of the same colored tiles and the chains. Use it sparingly, if you can, as it's the most expensive power-up. 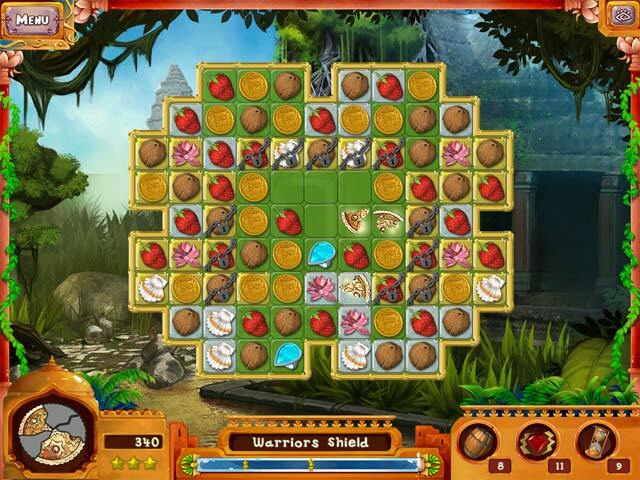 Rated 4 out of 5 by deddu from Trip to India Collect all 72 artifacts and 3 stars. This game is timed but on most levels you can finish in time to get 3 stars. The last several levels are harder but you can repeat as often as you want. I also recommend Trip to Italy -- this one has a relaxed mode. Rated 4 out of 5 by fredandethel from Seems simple at first but actually quite interesting The object is to clear tiles and lower object fragments at the same time, rather than the more usual having to clear all tiles before the objects to be lowered will appear - although some of the fragments are under wooden tiles. You can do it the easy way using lots of powerups, or try a bit of strategy as the timer is generous, at least in the demo levels. Not bought it yet but it will stay on my list of possibles for the future. Rated 4 out of 5 by kaydoodle from fix this game This game would be fine if it would continue to run and not cut out toward the end of finding the temple figurine. Sure wish someone would fix the problem. Rated 4 out of 5 by tutortime from Fun Game to play. This game was fun, the levels were fairly easy to achieve and the music was nice. Rated 4 out of 5 by annaontheshore from Game for relaxing I like Match 3 games, and decided to give this a try. As already said by previous reviewers, this is a simple, relaxing game that doesn't take too much thinking about. The screens are pleasant - can't comment on the soundtrack because I never listen to the music as it's usually so awful (like when you're in a lift, for the most part!) There's no discernible storyline, so no goals to aim for which might mean some players will find this boring from the start. I stopped after 20 minutes into the trial, but will probably go back to it later this evening when my brain power is at its lowest! Probably this is not the game for you if you like a challenge - might be though if you like to relax at the end of a hard day with something that's pretty to look at and doesn't take too much brain power!!! 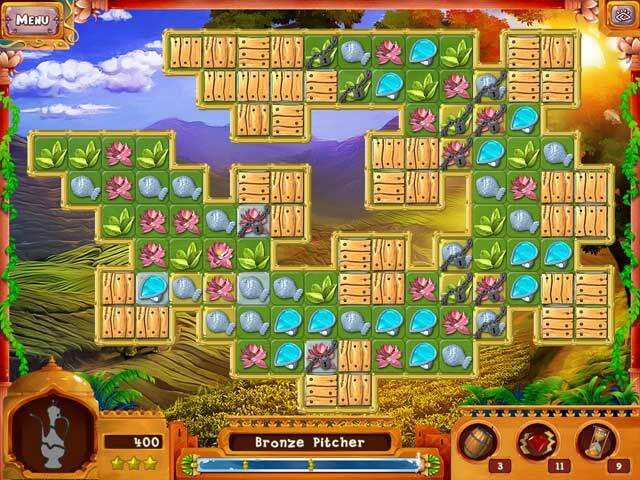 India welcomes you with its riddles, ancient wisdom, exquisite aromas and lost treasures in this match 3 adventure!